Jeff started by showing us a number of newspaper and magazine stories about bees that have featured a photo of a fly by mistake. Bees are what we think of when someone says pollinator, while flies go unrecognized for themselves or their importance as pollinators. For our agricultural crops, 39% are pollinated by honey bees, 23% by native bees, and 38% by other pollinators, most of which are flies. Flies are less efficient at pollination than bees, but make up for that by visiting flowers more often. They travel farther than bees, thus increasing the chance of out-crossing (moving pollen between plant populations). They also do not “steal,” i.e., eat pollen, so are more likely to transfer it to another plant. Flies are active at different times of the day and year and at different temperatures than bees. For example, hover flies are often active very early in the season and will fly on cool rainy days when bees don’t. There are 550 species of hover flies in Canada, making them the largest group of non-bee pollinators. Non-bee pollinators get little attention. 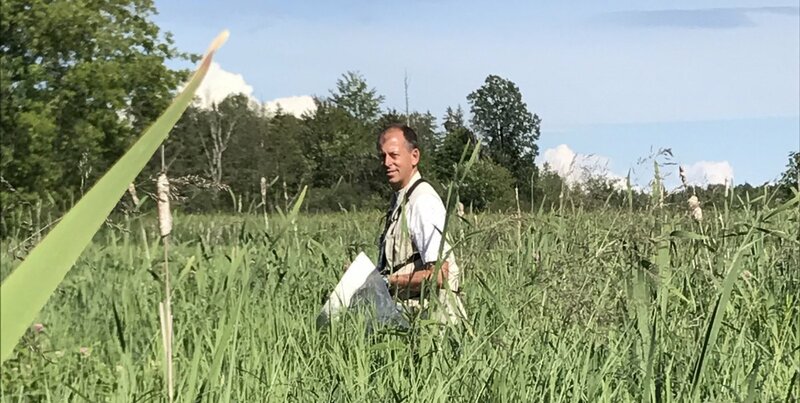 In a project Jeff was involved in recently, 200 scientists were studying pollinators; only 5 or 6 were looking at non-bees. The families of pollinating flies are all among the top fly families in terms of numbers of species. Have bristles, a “spare tire” under their scutellum, and are parasitoids. Important pollinators in arid and semi-arid areas. Come out in early spring to visit the first flowers. As larvae, they attack bees and wasps. Good at hovering. Tiny, so important pollinators of tiny flowers. Both larvae and adults are predators. When mating, males present females with a silk ball, sometimes containing prey. Sometimes females also give a present to males. Important pollinators in the Arctic and in early spring. Cluster flies are predators on earthworms; these species are not native. Blow fly adults visit flowers; most are metallic. Not only are these flies good pollinators, but, according to Jeff, they may also be useful as decomposers and in sewage treatment.